Manganese peroxidase exists as a series of glycosylated isozymes with pIs ranging from 4.2 to 4.9 and molecular masses ranging from 45 to 47kDa. Similar to LIP, each isozyme contains 1 mol of iron per mole of protein (Leisola et al. 1987; Paszczynski et al. 1986). To date, five isozymes have been detected in P. chrysosporium MP-1 (Kirk and Cullen 1998). Manganese peroxidase, like LIP has the same catalytic cycle as other peroxidases, involving a two-electron oxidation of the heme by H2O2, followed by two subsequent one-electron reductions to the native ferric enzyme. The primary reducing substrate in the MnP catalytic cycle is Mn2+, which efficiently reduces compound I and compound II, generating Mn3+, which then serves to oxidize phenols to phenoxy radicals (Hatakka 1994). Whereas it has been shown that cation radicals of aromatic substrates such as that of VA maintain the active form of LIP by oxidatively converting compound III to the native enzyme and preventing H2O2-dependent inactivation (Barr and Aust 1994), Mn3+ has similarly been shown to convert MnP compound III to native enzyme (Timofeevski et al. 1998). Additionally, Mn2+ also reactivated compound III and although this reaction was slower, it could prevent compound III accumulation when excess Mn2+ was present. In many fungi, MnP is thought to play a crucial role in the primary attack on lignin, because it generates Mn3+, a strong diffusable oxidant able to penetrate the small "molecular pores" between cellulose microfibrils, which precludes the action of LIP because of steric hindrances (Flournoy et al. 1993). Organic acids, such as oxalate (Kuan and Tien 1993), and fumarate and malate (Hofrichter et al. 1999), which are also produced by white rot fungi, chelate Mn3+. These stable complexes then deliver the oxidizing power. Although MnP does not oxidize nonphenolic lignin structures during normal turnover, these structures have been shown to be slowly co-oxidized when MnP peroxidizes unsaturated fatty acids (Jensen et al. 1996; Kapich et al. 1999a). Bao et al. 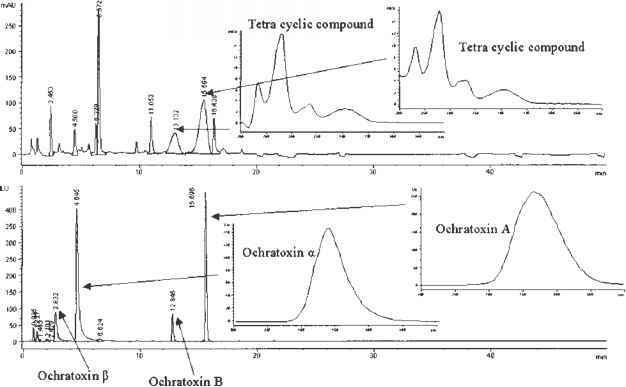 described the oxidation of a nonphenolic lignin model by a lipid peroxidation system that consisted of P. chrysosporium MnP, Mn2+, and unsaturated fatty acid esters (Bao et al. 1994). Substrate oxidation occurred via benzylic hydrogen abstraction and it was suggested that this process might enable the white rot fungi to accomplish the initial delignification of wood. The importance of Mn2+ and the involvement of lipid peroxidation in depolymerization and mineralization of 14C-labeled, polyethylene glycol linked, b-O-4 lignin model compound by C. subvermispora in wood block cultures and defined medium has been demonstrated (Jensen et al. 1996). Lipid peroxidation has been suggested as the mechanism involved in the oxidation of the nonphenolic lignin structures by white rot fungi that do not produce LIP.